I had the beginning of the year too much at the parents' house of Hirosaki city, Aomori pref at the end of the year and I invited a friend of Hakodate before departure and participated in the tour that was same as. Departure 1,992.1.3 from evening Narita Airport. At the time of 1,991.7.11 Mexico total eclipses of the sun, I decided participation last time for a half year because this plan was announced in Hankyu Express International. Partial solar eclipse with the golden ring solar eclipse which passes the sea near the shore in Japan is seen on January 5, 1992. 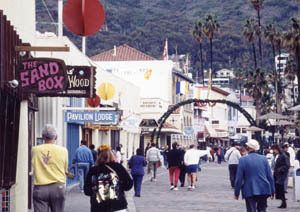 This observation observes a golden ring solar eclipse in the L.A offing beyond the date line on January 4, 1992 at sunset and watches aurora in Alaska. It is an A B course that observe only a golden ring at sunset. Which applied to a company of Tokyo where I worked at at the time of in it which the D course where. I that a price was the amount of percent participated in a C course because I had the beginning of the year too much in Alaska at the end of the year was for a schedule to be to 1,992.1.3-1992.1.10, and was 100,000 yen percent Yasushi from a C course for a paid vacation. 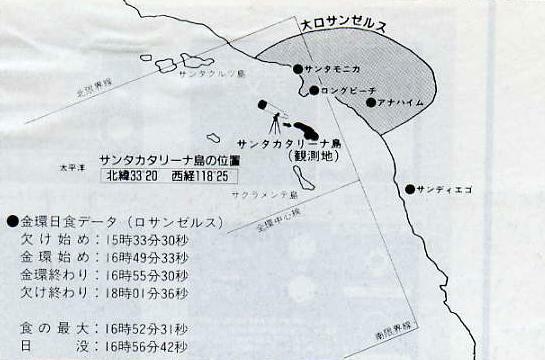 The airplane which took off comes in L.A across the date line in morning of 3rd. It is a flight of about 10 hours. 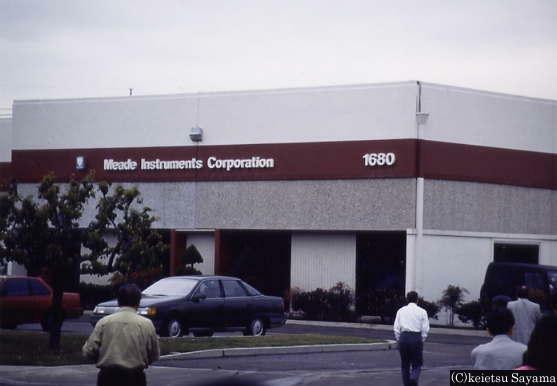 Take lunch after arrival at a restaurant, and is a bus at once; to a factory of Meade company. The president who wore a blue shirt met us. 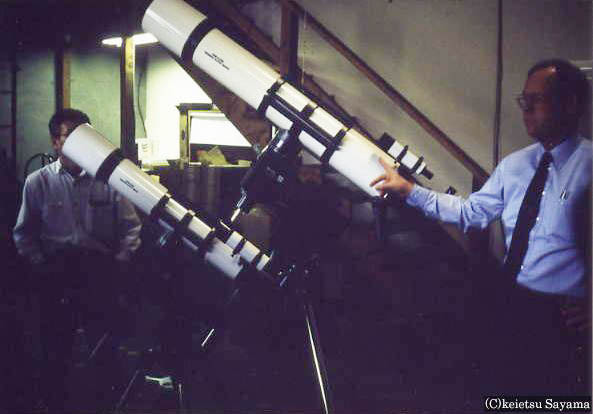 It begins from article explanation of a refraction put on a large dirt floor with a colonnade-type telescope and reflection type telescope at first. I really moved a telescope on the spot. I move a panel at hand and operate it. Then I moved to an outbuilding, and it was introduced an abrasion process of the lens which I wanted to watch most. At first a process to sharpen thick glass on a lens is full of a smell of machine oil before long. High speed turned smartly when I looked in the inside of a machine while it was worn water and abrasives a lens together. I seem to study hard by one side. Probably I think that it is an abrasion process of the main mirror. A lot of polished lenses were displayed in a neighboring room. Furthermore, there is an employee looking into the machine parts which were almost finished when I go in an outbuilding. 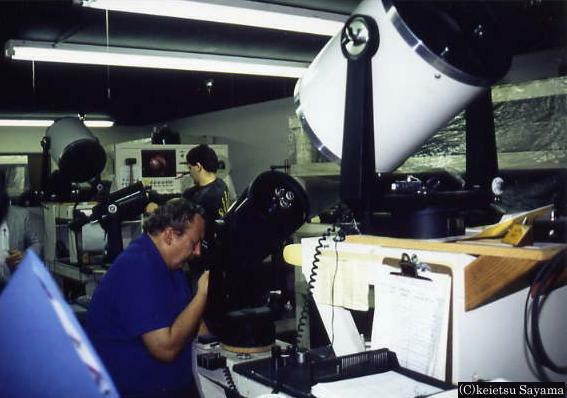 It is an inspection process of a lens. 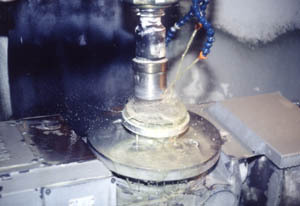 One machine parts are displayed in one cup of floor on a stand, and to inspect is hard. I move to an outbuilding again and introduce the spot put shipment / packing work and a pipe of a telescope. The yard of Meade company was large, and it was impressive that there was some outbuilding. A golden ring solar eclipse is seen in sunset today. It was the story that I heard later, but various places of a solar eclipse clearing house seem to have observed a golden ring solar eclipse for about 11 minutes in Kiribati right on the equator where a golden ring obi became longest. 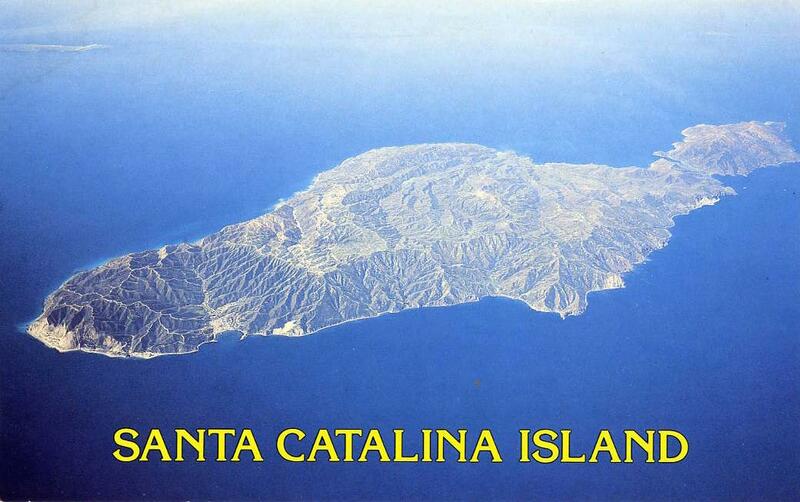 I go to Santa Catalina Island floating in the L.A offing at 9:00 a.m. You might have observed it in L.A, but went without question because it was the place where Santa Catalina Island could go to once in life. I get into a streamlined cool high-speed boat and strike an island! Like a sightseeing spot, there was an atmosphere of opening here. I go to the other side of a port by bus and observe it at a place setting in the west. I arrive one hour when a solar eclipse begins ago. I stand and put up observation machine parts at once. I have begun to be missing from bottom of the sun at 15:33. I photographed the sun of 10% for appetite at 15:40, and I saw the sun of 20% over a cloud for appetite at 15:50, but it was difficult, and a timing of photography did not come out. 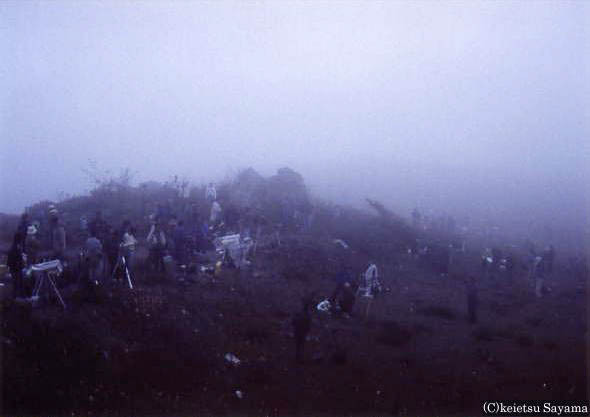 A thick cloud approached afterwards from slope bottom of the cliff which was photography point. An area was completely covered by a cloud when I did it as for only 10 minutes, and the sun which was able to never lack did not turn up. 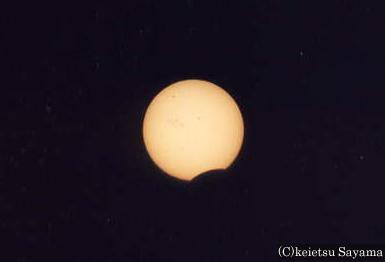 It is clouded, and the first golden ring solar eclipse is a great shock. Because I was annoyed, I said that a local American "showed an album" if I looked at a photograph album of a Mexican total eclipse of the sun that I took last time on the spot. Is take an album, appearing with what not whether you were unsatisfactory only by watching an album? I would hate not being seen in large measure. Because there was no help for it, I willingly consented. I got on all of you bus without waiting for sunset and departed to a port. The way home to L.A was totally an atmosphere such as a wake with the expression that all the members are keeping silent. When I bought a newspaper in L.A Airport on the next morning and confirmed the yesterday's solar eclipse, the golden ring solar eclipse which set in the horizon how looked it to you! It seems to have been taken in sea ashore of a Sanji ego. I overdid it yesterday and remained in L.A and should have moved? I thought of . After a flight of two hours and a half, I arrive at Seattle. It is an A B C course and parting here. We D course moves from Anchorage of Alaska to Fairbanks and arrives at late-night lodging place. When I arrived at Fairbanks, when I can be frozen very much and take a deep breath, a nasal cavity is frozen and seems to be close together. which felt cold from skin.